Hello everyone! Hope you will have a great week ahead! I bought the plum top almost six years ago at Dillards but turned out I didn't wear it much because there are so many things going on: bow, lace, cut out back... Anyway, I gave it another try yesterday by pairing it with my favorite pleated skirt. P.S: By the way, I am suffering from a very bad cold sore now. It really drives me nuts. I have been trying Camphor and Abreva and none of them worked and I couldn't make an appointment with any dermatologist until early next week. Any suggestions or advice are highly appreciated. Thank you! That is such a pretty top! You look lovely!! i really love those colors~ purple and blue compliments each other quite greatly! 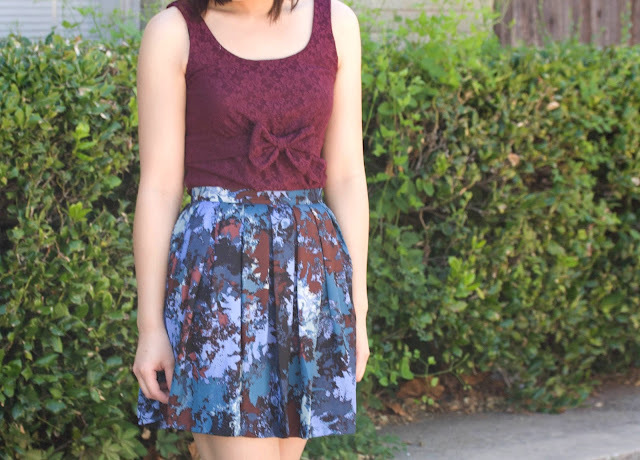 the skirt and top look so well together, the colors go beautifully together!! :) thanks for the comment on my blog.. I am so loving the plum color lately! I love your skirt very much and it matches very well with that top!